The PlayOn Group Pty Limited is a joint venture between the Sydney Swans and Playbill Venues. In May 2019, the PlayOn Group will become the official lessee of two much-loved heritage buildings in Moore Park: the Royal Hall of Industries and the Hordern Pavilion. Together, we welcome a once-in-a-lifetime opportunity to write the next exciting chapter for Moore Park’s leisure and entertainment precinct. As long-standing Moore Park tenants, our partnership is a powerful and proven combination of music, sport and community. We share a strong connection to the area and a commitment to ensuring its sustainable future. 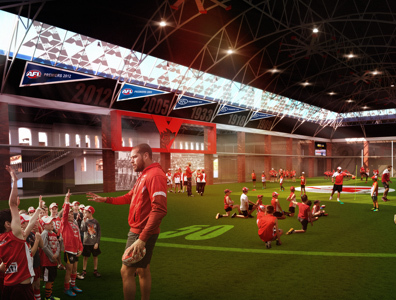 A substantial capital works investment will see the Royal Hall of Industries become the Sydney Swans HQ and Community Centre and new home of the NSW Swifts. This infrastructure will take the Swans into the future. It enables the Club to expand its youth academy and establish a women’s team. The Royal Hall of Industries will also welcome co-tenants: the NSW Swifts, QBE Sydney Swans Academy, Australian Red Cross Blood Service donation centre, GO Foundation and Clontarf Foundation. In addition to a cafe and museum, the new Centre will house an international standard netball court and a multi-purpose recreation and function space, which will be accessible to the community. Sydney’s iconic venue will benefit from a major renovation to protect and enhance its role as a premier live music and entertainment venue. 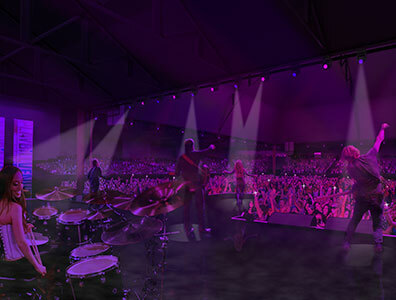 The significant upgrades will deliver an improved experience for patrons and performers and offer greater flexibility for a wider variety of events and performance options. The work will ensure the Hordern retains its status as a first-choice event venue at the heart of live entertainment in Sydney. We will establish a new outdoor public entertainment space between the Royal Hall of Industries and the Hordern Pavilion. 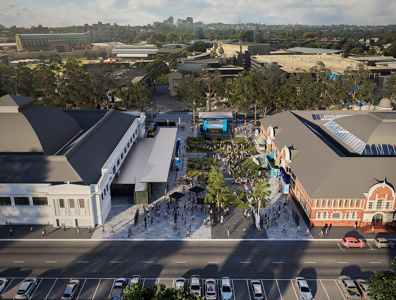 Existing fences will be removed, and the area will be connected to Sydney’s light rail to create a new gateway to the Entertainment Quarter. This shared forecourt will become a destination in its own right with year-round sport, cultural and recreation activities. All illustrations / renderings are artist’s impressions only, subject to final design, planning and development approvals.